Last week's Red Lentil, Bulgur and Mint soup did in fact make it to the Be-Wiched Express menu this week. And, the red lentil soup was such a perfect dinner that we decided to make another soup at home this week. 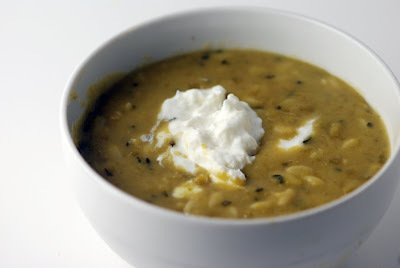 The recipe was inspired by a Turkish split pea soup, but we transformed the original into a thick vegetarian stew with green split peas, orzo and yogurt. A delicious and filling dinner, with enough leftover for a second night. Melt butter and oil together in large sauce pan over meidum. Add onion and saute until soft. Add split peas and stock, bring to boil, then reduce to simmer and cover. Cook until split peas are soft and broken down, about 1 hour. Cook orzo, drain and set aside. Combine cornstarch and 1/4 cup cold water until smooth. Add to soup, then bring soup to a boil, stirring constantly. Reduce to a simmer, add mint, season with salt and pepper. Add orzo and simmer until soup is thick. Remove from heat and add heavy cream. Serve with 1/4 cup dollop of yogurt in each bowl. How do you always manage to post the very thing that I was craving without realizing it until I see it here? This looks so satisfying. I really love the sound of this! I have some yellow split peas as the moment that I bet would be tasty in this. I love the orzo, very nice touch. Nice delicious soup! I really enjoy reading your recipes! I love split peas. This is a decidedly different version than my traditional soup - and I love it! I love split pea soup! This seems like such a soothing meal since it's getting much colder here in NY. Especially with a storm this weekend, I think I'll have to lock myself up in the apartment with a steaming bowl of soup! I just made some of this and it is delicious. I actually chucked in an apple and some curry powder too (but left out the cream and yogurt to make it vegan).